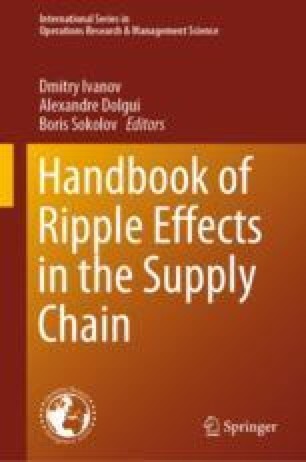 Despite a wealth of literature on disruption considerations in the supply chain (SC), a method for quantification of the ripple effect that describes disruption propagation in the SC has not yet been developed. In addition, there are only a few studies that incorporate recovery into the performance impact assessment. This chapter develops a method to quantify the ripple effect in the SC with recovery policy considerations. We study a four-stage SC over time and consider both performance impact assessment and recovery decisions. The performance impact index developed is used to compare sales (revenue) in different SC designs to measure the estimated annual magnitude of the ripple effect. First, we compute optimal SC replanning for two disruption scenarios. Second, we estimate the performance impact of disruptions for six proactive SC designs. Finally, we compare the performance impact index of different SC designs and draw conclusions about the ripple effect in these SC designs along with recommendations for the selection of a proactive strategy. The performance impact index developed can be used to analyze how different markets are exposed to the ripple effect and how to compare different SC designs according to their resilience to severe disruptions. The research described in this paper is partially supported by the Russian Foundation for Basic Research 17-29-07073-ofi-i, and State project No. 0073-2019-0004.